It’s the third period of a hockey game against the Montreal Canadiens when Eric Staal shoots and scores. The young star of the Carolina Hurricanes, the current champions in the National Hockey League, seizes the puck and shovels it accurately between the goalposts from several meters away. 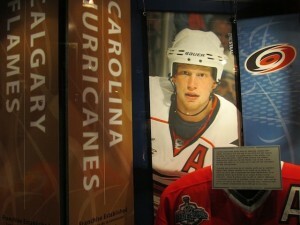 Eric Staal plays with the Carolina Hurricanes. It is the 25th goal this season for Staal, a tall, 22-year-old Canadian of Dutch background. Together with two assists that have also yielded goals for the Stanley Cup holders, he has done his part for a 5-3 victory for the Hurricanes. It’s the way Staal, in his third year as a professional hockey player, earns his salary of $4 million with the team from Raleigh, North Carolina. Perhaps equally important for Staal is that the goal has made him catch up to his younger brother Jordan (18). Jordan Staal is playing his rookie season with the Pittsburgh Penguins. He has impressed many with his performance. During a match this month against his childhood idols, the Toronto Maple Leafs, he scored three goals – the youngest player to date in the NHL to achieve a hat trick. He now has 25 goals to his name, the same number as brother Eric this season. 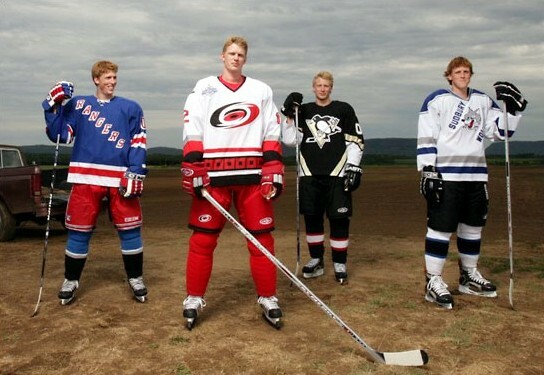 Friendly but driven competition is typical for the Staal household. The rural Ontario family of Dutch descent is fast becoming an institution in professional hockey. In addition to Eric and Jordan, 20-year-old defenseman Marc Staal has already been contracted by another NHL team, the New York Rangers. He is currently still playing for the Sudbury Wolves, a minor league team in Ontario. The youngest of the Staal brothers, 16-year-old Jared, has started his ascent at that same club this year. The Staal brothers became avid hockey players during the harsh winters in the remote city of Thunder Bay, Ontario. Their father, Henry Staal, a son of immigrants from the province of Drenthe in the Netherlands who immigrated to Canada in the 1950s, built an ice rink on the land of his farm where grass sods are cultivated from spring to autumn for lawns and golf courses. “In wintertime we have more time on our hands, and I had to give the kids something to do,” says Henry, who grew up as a good Canadian: he watched hockey games on TV and learned to play the sport with his brothers. The rink was an attraction. “We were out there all the time,” says Eric. “It kept us busy and out of the house with four boys. As soon as we got back from school we were out there right away, until my mom called us in for dinner.” Mother Linda Staal is a daughter of immigrants from the Dutch province of Overijssel. Father Henry, who unlike his sons speaks some Dutch, started noticing that his sons were excelling on junior teams. “They were always among the better players on their teams.” He brought the boys to hockey training, but did not personally coach them. Both parents acted as facilitators, not as hard taskmasters who demand top performances from their kids. “They knew we all loved hockey, and they were supportive of us doing it,” says Eric, who dreamed of playing in the NHL from age 7. Jordan and Eric Staal in action in the NHL. With his 1m95 and 93 kilograms, Eric is relatively slender compared to the older, tough players who check him; he has tall, Dutch looks. “He going to get bigger, and as that happens, he will become an even better player,” predicts DeCock. Highlight for the Staal family was the Stanley Cup victory by Eric and the Hurricanes last year. As customary, each player is allowed to take the cup home. Eric brought the Cup to Thunder Bay and threw a party at the farm. “To win the Stanley Cup is something you dream about, and happened for me already,” he says. That was also true for Eric’s grandparents, all in their eighties. Henry Staal: “My dad and my father-in-law just love the game, they watched hockey their whole lives.” Both grandmothers have been cooking Dutch dishes for the boys since they were little, such as stamppot (potatoes mashed with vegetables), meat and boiled potatoes, and vegetable soup, or groentesoep. “They love to go over on Sunday for oma’s vegetable soup,” says Henry, using the Dutch word for grandma. “That’s what put them over the top,” he says, laughing.